An official report has revealed that fingerprint staff involved in the Shirley McKie case were guilty of "professional negligence". The MacLeod Report has been handed to a parliamentary committee, which has now made it public. The report makes clear why ministers paid the former detective £750,000 compensation over print allegations. There have been calls for the four fingerprint officers involved to be sacked, but the public sector workers union Unison dismissed the report's findings. Justice Minister Cathy Jamieson handed the Holyrood inquiry investigating the fingerprint service the John MacLeod report, and a separate report by independent expert Michael Pass, on Tuesday after a long wrangle. Mr MacLeod, an independent fingerprint expert, was hired by ministers when they faced legal action by Ms McKie. The 29-page presentation explains why the 1997 print was not left at the murder scene by Ms McKie. The most damning part of his investigation concluded that "reasonable care could not have been taken during the comparisons that wrongly made this identification". Earlier in the report he said a mistake made without a reasonable degree of care being exercised would be professional negligence. 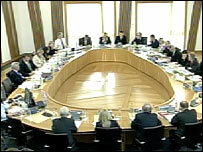 MSPs on the Justice 1 Committee will have a chance to question Mr McLeod next week as part of their inquiry. A Unison spokesman said: "It cannot be professional negligence when other experts made the same identification including the first expert instructed by the McKie's themselves." But Scottish National Party MSP Alex Neil said it was a devastating document, adding: "Why the Scottish Executive tried to suppress it I do not know. "But now that we've seen the document it's very clear to me that the four SCRO officers should lose their jobs. "Quite clearly they have no credibility as fingerprint experts." On Tuesday, the lord advocate again refused to release the Mackay Report - a criminal investigation into the service. It had been made available to BBC Scotland in May and found that failures to address errors in the McKie case by the Scottish Criminal Record Office (SCRO) amounted to "criminal action". The author, James Mackay, refused to answer questions on his report before the Justice 1 Committee inquiry on Tuesday.